Seems like there is hardly a fair comparison. You get the same end result, but Term Insurance makes a whole lot more sense. 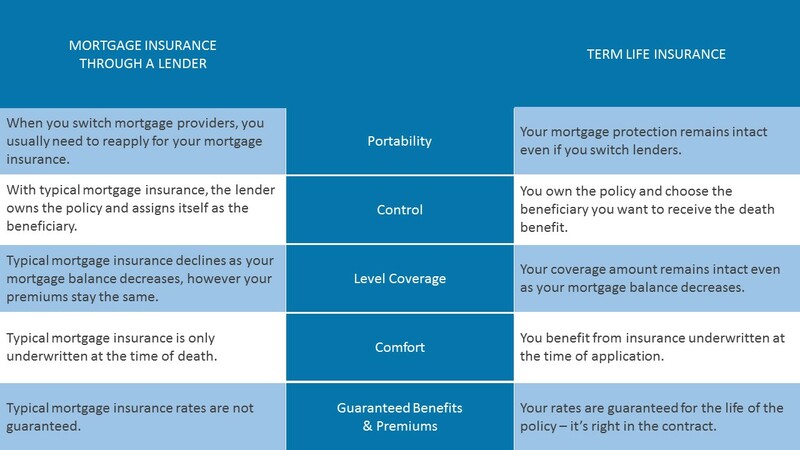 One of the possible solutions we recommend is that you purchase Individual Term Life Coverage for your mortgage in the event of premature death. In the event of premature death, your beneficiaries can either pay off part of (or all of) the mortgage right away, pay off other debts, use the money to fund a child or spouses education, or even invest the money – it’s their choice! Your insurance needs are as unique as you are, so it’s important for you to get professional advice to suit those needs. Call us for a review of your unique needs.